American Mathematical Society - Mathematical Reviews Cambridge Scientific Abstracts Compendex (Engineering Information) FIZ Karlsruhe INSPEC This international journal publishes both theoretical and application-oriented papers on various aspects of conventional and intelligent control, intelligent systems, and soft computing including fuzzy logic, neural networks, genetic algorithms/evolutionary computing, and probabilistic methods. Techniques may include frequency and time domains, linear and nonlinear systems, and deterministic and stochastic processes. Hybrid techniques that combine conventional and soft-computing methods are also included. First published in 1972, this journal originated with an emphasis on conventional control systems and computer-based applications. Subsequently, with rapid advances in the field and in view of the widespread interest and application of soft computing in control systems, this latter aspect was integrated into the journal. 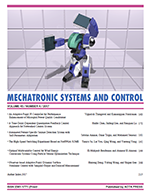 A unique feature of the journal is its pioneering role in bridging the gap between conventional control systems and soft computing, with an equal emphasis on theoryand practical applications, including system design and instrumentation.